At least 34 bodies were found at a casino resort in the Philippine capital after an attack by a gunman overnight and most of them had died of suffocation, the ANC news channel reported, quoting sources at the Bureau of Fire Protection. Police said earlier the gunman’s motive was likely robbery and that the incident was not terror-related. The gunman fired shots and set gaming tables alight, sparking panic at the resort. Shots and loud bangs rang out shortly after midnight in the buildings close to Terminal Three of Ninoy Aquino International Airport and an air force base. “Don’t panic, this is not a cause for alarm. We cannot attribute this to terrorism,” dela Rosa said. Dela Rosa said the suspect was “foreign-looking, a Caucasian, about six feet tall”. The gunman may have escaped because smoke had obscured footage for CCTV cameras, he added. A Reuters witness saw armed police entering a hotel near the complex. Videos posted earlier on social media showed people fleeing as several loud bangs were heard. Thirteen people had been treated at a nearby hospital for smoke inhalation and fractures, hospital staff told Reuters. The Philippines has been on heightened alert amid a crisis in the south of the country, where troops have been battling Islamist rebels since May 23. President Rodrigo Duterte declared martial law on the southern island of Mindanao last week. U.S. President Donald Trump said Washington was closely monitoring events unfolding in Manila. The U.S. told Americans in the city to exercise caution and review their personal security. 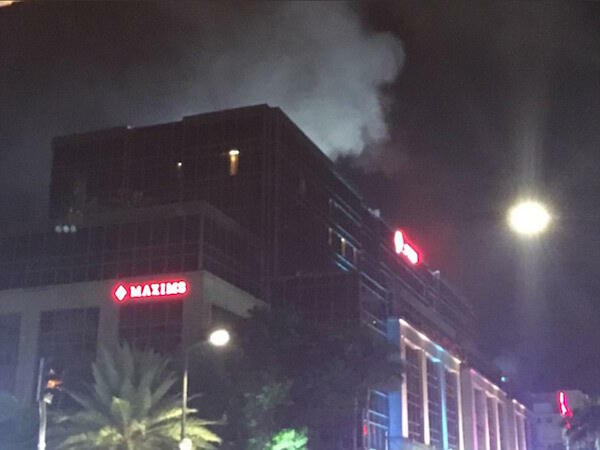 Resorts World Manila said on social media it was in lockdown. “We are searching the area as much as we can, to make sure it is clear,” a Resorts World official, Stephen James Riley, told reporters. Large numbers of police massed outside as smoke rose from the hotel and shopping complex, which according to its website holds the largest casino resort in the country. “We ask for your prayers during these difficult times,” Resorts World said on Twitter. Military spokesman Restituto Padilla said the police were in control of the situation and the army was monitoring closely. A casino worker from the third floor of the complex, named Julio, told DZMM radio he heard many gunshots and saw people running up the stairs from the second floor. Ronald Romualdo, a maintenance worker at Resorts World, told the station he saw a woman fall from an upper floor while trying to escape. “Several people were injured,” he said. Police chief dela Rosa said it was possible militant group Islamic State would claim responsibility for the incident for propaganda purposes. President Duterte has said he fears Islamic State’s “terrible ideology” will spread on Mindanao, an island of 22 million people, and has warned it could become a haven for supporters fleeing Iraq and Syria.